Midwest Family Dental offers a range of general dentistry treatments for oral health and hygiene. From identifying tooth decay to root canals to dental crowns, our team of expert dentists in Chicago are there to educate patients on their dental health and delivery quality, affordable family dental care across the Chicago downtown and metropolitan area. We also provide guidance in preventive dentistry services to stay ahead of these general dentistry needs. 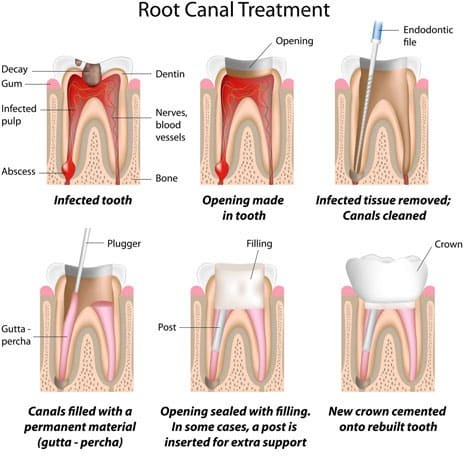 If tooth decay is left untreated it will eventually spread to the tooth’s pulp or nerve causing an infection and pain, this is an indication for root canal therapy. During a root canal, the infected nerve within the tooth is removed. The procedure feels no different than having a simple filling done, the key is proper anesthesia. We will ensure that you are properly numb before doing this or any procedure. After a root canal, the tooth will have to be built back up with a post and core. A root canal will weaken the overall structure of the tooth, so a crown is always recommended to add strength to the tooth and prevent a fracture. In the case of any dental emergencies we offer emergency dental care across the Chicagoland area. Tooth decay is created by bacteria in your mouth. When the bacteria encounters a food source such as sugar, an acid is produced which begins to breakdown the tooth. This results in what is known as tooth decay or a “cavity”. Not all “cavities” will cause pain, but it is important to have the decay removed and filled with either a silver or white filling to prevent it from spreading to the tooth’s nerve or pulp. This general dentistry procedure is also recommended if a tooth has cracked or is missing a large portion. Dental crowns will take multiple dental appointments to ensure the dental crown it is being handled properly. At the 1st appointment, the tooth is prepared and a mold of the tooth is taken. The mold or impression is then sent to a lab where the dental crown will be made. Our expert dentists in Chicago ensure you leave from your 1st appointment with a temporary crown and when you return 2-3 weeks later we will have the final/permanent crown cemented. 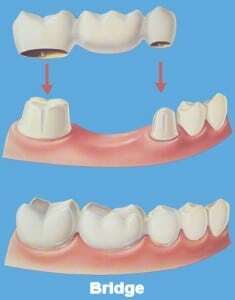 One method of permanently replacing missing teeth is with the general dentistry practice known as a fixed bridge. This general dental procedure is similar to a crown in that it takes 2 appointments as the teeth need to be prepared or shaved during the 1st appointment. A bridge does exactly what its name means: it “bridges” the space left by a missing tooth or teeth.